twinfants Archives | How Do You Do It? Life with twinfants in the house is HARD. Most of the time I am so busy trying to maintain the peace, that I’m not aware that we’re raising twins. If I were, I think it would wear me out. We are so close to the edge at every minute that it doesn’t take much for our household to spiral out of control. It is a delicate balance, one that I have best maintained with the help of a routine. If you’ve ever read my personal blog, playdatecrashers.com, you will quickly learn that Tracy Hogg is my baby guru. I owe all of my baby care survival skills to her. Around my house we live and die by the routine. Our two year old son is a great sleeper, and I think it is due to us keeping a fairly predictable routine since he was a few months old. Thankfully he still enjoys sleeping in the confines of his crib. I am a little nervous about his inevitable transition to the big boy bed, and the new freedoms he will enjoy with it, but I am sure that when the time comes we will tackle it just like everything else, one step at a time. With the twins it was a lot easier to establish a routine because they were born 8 weeks premature and spent the first two weeks of their lives in the NICU. Since they came home with a three hour routine, the main thing we had to do was help them learn how to sleep at night, which they do quite well. The first six months (since they were born), have been a lot more manageable that I imagined (not that we haven’t faced a few moments of hopeless chaos here and there). We have recently entered into dangerous territory, which I will refer to as “the change”. It couldn’t have come at a more inconvenient time. For those of you who have yet to experience the joys of “the change” it usually falls between 4-6 months and has something to do with baby’s growth spurts, teething, and new skills. Symptoms of the change are drooling, mood swings, sleep disruptions, and inconsolability. There is a much higher success rate to sail smoothly through this face with a singleton, but for Twinfants (especially if they tend to be synchronized) parents should hunker down and prepare for the worst. 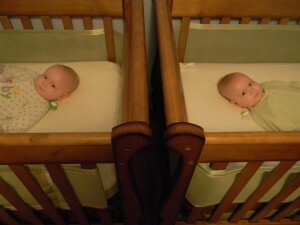 Saturday, things finally came to a head when I had reached the third nap of the day and both babies wanted nothing to do with lying in their cribs and drifting peacefully off to sleep like they normally do. I feel like I should also mention the fact that my back-up had been MIA for the past 36 hours because of school and work responsibilities and was recovering from a church youth group over-nighter. I remember sitting on the bed with one baby crying in the nursery and me holding the other, feeling like all of our hard work had been flushed down the drain and that we would have to start from the ground up to get back to where we were. My solution: escape the chaos and walk away. I quit trying to stick to the routine for the day and we loaded everyone into the van and headed out on the town. It worked! Then, on Sunday I discovered that I had not been giving them enough Motrin, and once I gave the right dosage they took a peaceful three hour nap, which naturally moved them to the four hour routine I have been trying to transition to for weeks. Twinfancy is hard. The best we can do is to try not to lose our heads when we realize that we are in over our heads. We may be close to the edge at every moment, but the solution can and will be found among the chaos. What strategies have you found helpful when you were in over your head with your multiples? Jamie is the baby whispering mother to three lively boys, big brother age 2 and identical twins age 6 months. Check out Jamie’s blog and podcast, The Playdate Crashers.